Northern California’s CompoClay is currently developing new green garden décor and building products. This is just the beginning. It’s a really exciting time for us right now. Now that CompoClay is settled in its Northern California headquarters, the eco-friendly material manufacturer is completely focusing on product development. Its in-house designers have been working diligently to expand CompoClay’s product offerings, which include green home accents, garden decor and architectural elements. Some of these new designs were introduced at the NorCal Spring Trade Show this past February and many more are slated for unveiling at the upcoming National Hardware Show, occurring from May 1 to May 3. Eco-friendly designs currently available from CompoClay include planters, sculptures, wall décor and mirrors. The upcoming expansion will also focus on home accents, such as picture frames, candleholders, cases, flower pots and bookends. New garden décor and landscape--CompoClay’s most robust category--will include brand new living wall planters, outdoor stools, patio furniture sets and Planter Ash-Trash. “With the continuing growth of green building, CompoClay hopes to further develop its line of decorative building products that currently consists of wall panels, ceiling troughs, railing and insulation panels,” Choi said. To date, CompoClay has designed and manufactured eco-friendly products for companies like Gump’s San Francisco and Studio-A, and seeks to establish more partnerships in the future. CompoClay’s products are handmade and hand-finished down to every exquisite detail, and inspected to meet CompoClay's rigorous quality standards. 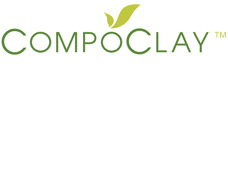 For more information about upcoming products or any of CompoClay’s products or services, call 415-877-4123 or view the store on the web at http://www.compoclay-ca.com. CompoClay has two Bay Area showrooms, located at 60 Post St. in San Francisco and 2536 Santa Clara Ave. in Alameda. CompoClay offers stylish, eco-friendly home accents, garden decor and building products, made entirely from CompoClay, a cutting-edge, raw material, mainly made up of minerals, sand and water. CompoClay is a green alternative to hazardous materials, such as resin and polyurethane foam, commonly used in the home decor and building industries. CompoClay has the ability to emulate everything from wood and metal to stone and ceramic, without sacrificing safety and durability.